It’s not about the guy on the other side. It’s about the Calgary Roughnecks. “Over the last few games we’ve spent a lot of time on the opponent and focused on what they do,” admitted coach Curt Malawsky. “And the last game we really focused on remembering who we are. The late Terry Sanderson taught me that and it’s something that stuck with me, and it’s so true. That being said, the guys on the other side – the Georgia Swarm – are pretty good. Sitting tied atop the East Division standings with a 12-4 record, the Swarm have won five straight games and are coming off of a 17-10 win over the San Diego Seals. “They’re solid in all areas; from the goaltender, to the defence, to their draw guy, their special teams is exceptional – but the big thing is their offence,” Malawsky said. “These guys move the ball really well, they’re very unselfish; every single guy on the offence is moving. They’ve got inside threats, outside threats, you can’t predict what they’re going to do any shift. They play by instincts and their offence is phenomenal. The Riggers will have their hands full defensively, as Georgia boasts a well-rounded attack featuring Myles and Lyle Thompson, Randy Staats, and former Roughneck Holden Cattoni. After a setback against the Seals two weeks ago, the Roughnecks rebounded for a huge 18-13 win over the Philadelphia Wings. 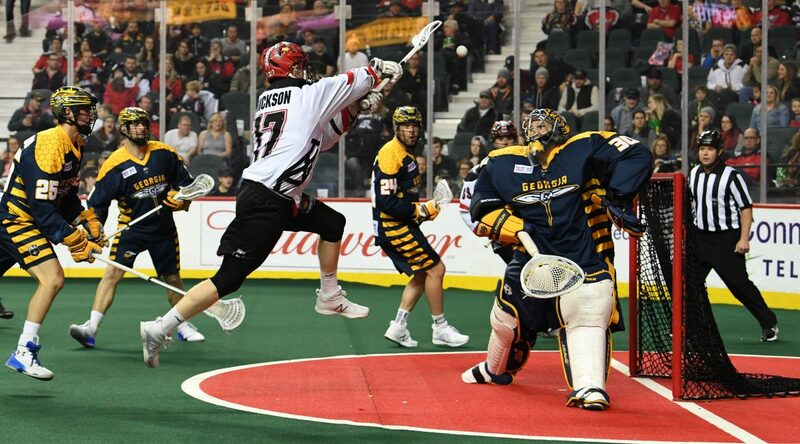 With a pair of games remaining on the regular-season schedule, Calgary is looking to solidify their spot in the playoffs and prove to themselves that they can achieve a high-level of success against some of the best teams in the NLL. “We’re playing one of the top two teams in both the East and West in the next two weeks,” said Malawsky. “So we’re definitely going to see where we stand, and if we’re ready for our playoff battle. I wouldn’t want anything different … it’ll be a test to see if we can stick to our principles, and core values over the next two weeks and get ourselves prepared for the playoffs. All in all, fans will want to be in the Scotiabank Saddledome for this Friday night affair. “The fans are in for a treat, this is a really good lacrosse team coming to the ’Dome,” opined Malawsky.